I've really loved watching all 3 of my kids turning into really good cooks and bakers. When they crash at home for awhile, the kitchen really gets some action. Over Christmas, 2 of them were home, and I enjoying the wonderful gift of sitting back, letting them take over much of the cooking, and watching them create some unique, yummy food, some even healthy! 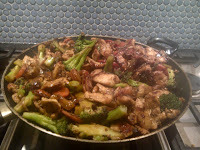 One of the dishes my son tried out was a Mongolian Beef dish from Cooking Light. This dish got 2 thumbs up from all of us, though we decided it needed a little tweaking in the vegetable department. The original dish only called for green onions. The next time we made it, we cut back on the onions and added carrots and pea pods. It would also be wonderful with broccoli or mushroooms. Though it does use some ingredients you may not have on hand, it's worth buying them, because you'll want to make it again and again. Just have some fun switching up the protein and veggies. And, it makes create leftovers for a future meal. Enjoy! Add prepared sauce and cook 1 minute or until thickened, stirring constantly.